Instant Imprints Greenville, NC | Custom T-Shirts, Embroidery, Signs and More! At Instant Imprints Greenville, North Carolina, our customers come to us when they want to be more visible to their customers. We create that visibility five different ways: Branded Apparel (embroidery), Signs & Banners, Promotional Products, Custom T-Shirts and Print Services. North Carolinians know the promotional power of custom t-shirts, printing services, promotional products, custom banners and branded embroidery items as a way to drive up brand visibility. Instant Imprints in Greenville supplies individuals and businesses alike with the promotional goods they need to succeed with their projects. Whether you’re looking to promote a new product, an upcoming event or push your brand as a whole, our Greenville Image Experts are happy to help you get the job done right, the first time. Let Instant Imprints be your promotional partner, no matter what your advertising goals are! When you need the quality and value of an industry leader combined with the North Carolina touch of a local Image Expert, Instant Imprints is the print shop for you. Our years of experience helping brands achieve their promotional goals makes us adept at helping businesses, sports teams and individuals promote themselves in a superior way. The expertise of our Image Experts combined with our state-of-the-art production processes makes us your best choice for promotional goods of all kinds. Just ask your phone while you’re in Greenville, “What’s the best print shop near me?” and Instant Imprints is sure to top the list! Custom t-shirts are tried-and-true ways to give your logo legs. Across the Carolinas and beyond, your logo can travel along with your employees and customers, wherever they go. Virtually every major brand out there has a custom t-shirt design of their own, and for good reason. Custom tees can make your logo fashionable—they may even start a fashion trend. This is why it’s important to only use the highest quality custom t-shirt service around, which you’ll find at your Greenville Instant Imprints! When you need to stand tall and reach more prospective customers, there’s no better way than with custom signs and banners. We have a wide variety of design features and customization options, so your brand can stand out in its own unique way. Whether it’s with a savvy sidewalk sign, a trade show display or a billboard banner, our Image Experts can help you craft the perfect sign or banner for the occasion. 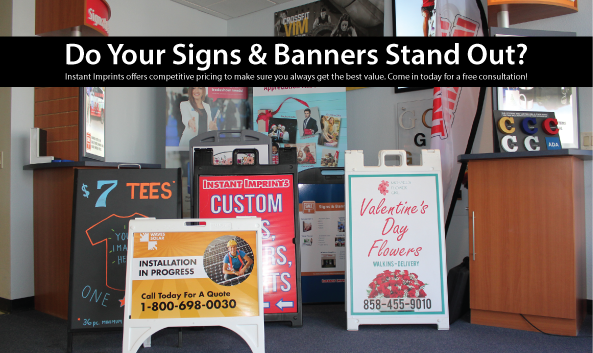 Best of all, your custom sign or banner is crafted all under one roof, right here in Greenville! When it’s time to bring your brand visibility to new heights, stop by our showroom on E Charles Blvd, give us a call at (252) 364-3254 or request a quote online today!